Pearl is the oldest known gem and was considered the most valuable for centuries. It has a color ranging from white to almost black including silver, cream, pink, champagne, (gold) green, and blue, are often naturally occurring. What distinguishes pearl from other gemstones is that it is organic matter derived from a living creature - oysters and mollusks. Its chemical structure contains of calcium carbonate in minute crystalline form, which has been deposited in concentric layers. 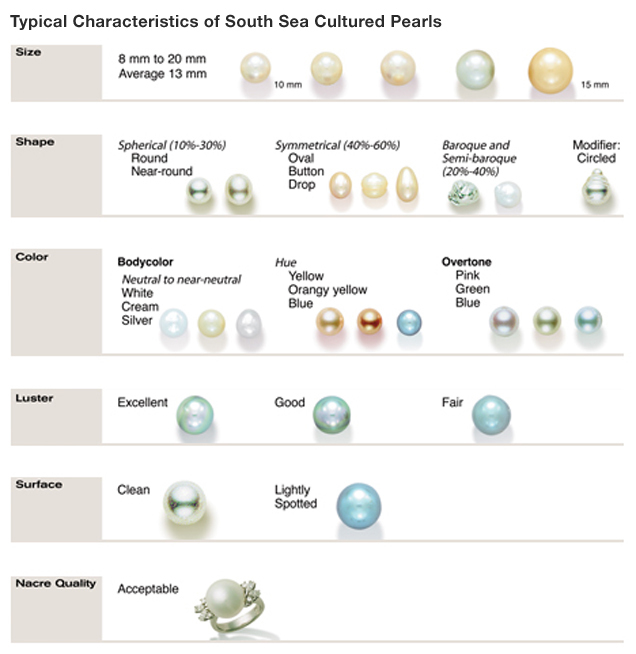 As it is a natural organic gem, it may occur in many shapes and each shape is quite unique, every pearl has a slight difference in its shape. We source our pearls from different parts of the world for their best attributes and qualities. We ensure the pearl farms and suppliers we work with are ethical and provide only responsibly sourced pearls. There are a variety of pearls we use and love in our pearl jewellery. Lustrous 'Rainbow' Pearls: Our rainbow pearls is our signature pearls. As its name suggests, they have a range of amazing natural colours such as white, peach, pink, gold, metallic, plum and aubergine-purple as the picture shown above. They come with the most amazing lustre which originally only shown in some high-end saltwater pearls such as Tahitian or South Sea pearls. Most freshwater pearls are nucleated by tissue, but these lustrous cultured pearls are nucleated with beads, exactly as saltwater pearls, only one pearl is cultured in each mussel, allowing for a much larger sized pearl to grow inside the shell. Therefore our 'rainbow' pearls have an average size of 10-14mm, which makes them more eye-catching along with their unique rainbow colour. 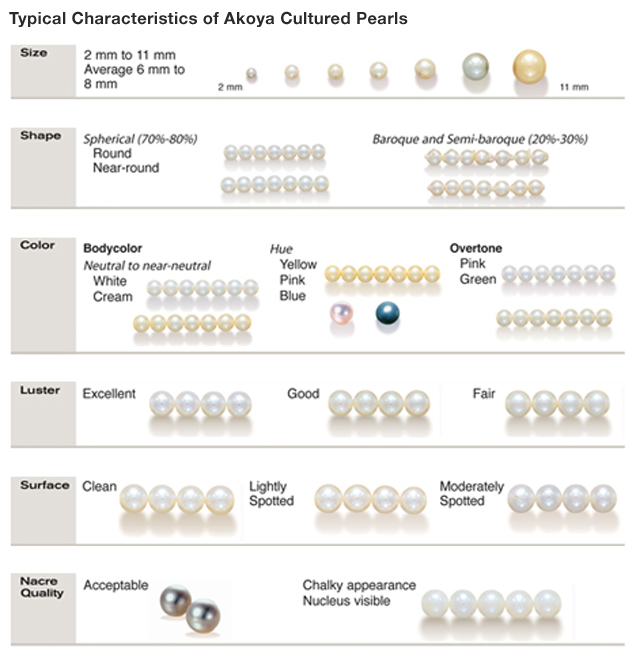 Akoya pearls: Akoya are round pearls cultured in the saltwater mollusk. The nucleus of these pearls is a round bead made from the shell of an American mussel. Akoyas are seldom more than 9 millimeters in size. Japan and China both produce saltwater Akoya cultured pearls. 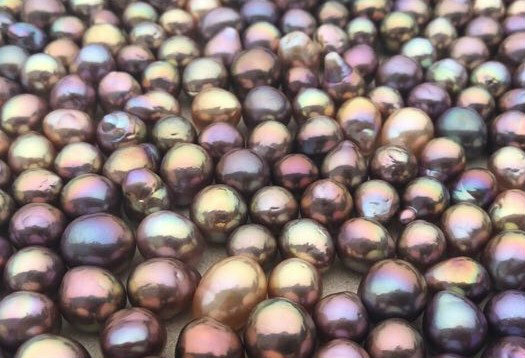 South Sea Golden pearls: These pearls are cultured in the South Pacific, particularly in Australia but also in Indonesia and the Philippines. They are made by the golden-lipped oyster, nucleated in the same way as Akoyas and come in round or barque shapes. South Sea pearls is among the largest on the market. The colour range from pale, sunny yellow to honey amber. The most desirable golden south sea pearls boast a deep golden hue. 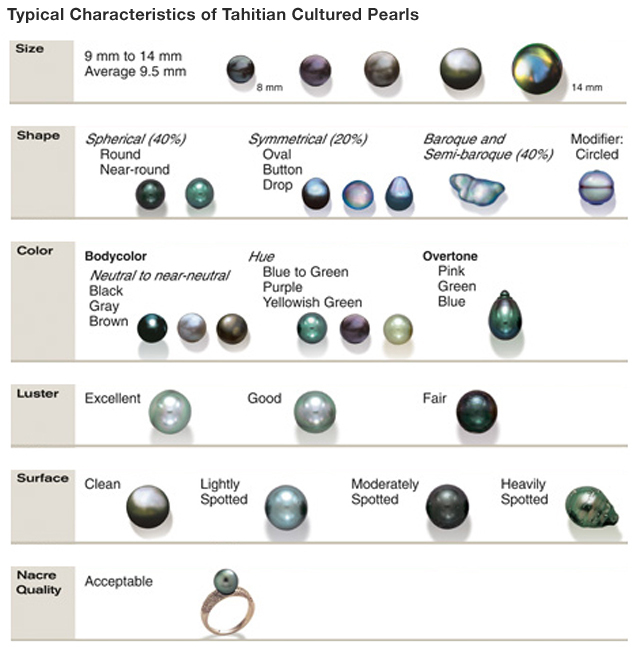 Tahitian Black Pearls: These alluringdark pearls come from the black-lipped oyster, which resides in the temperate turquoise waters off French Polynesia (the most familiar of these is Tahiti). In contrast to other pearls, these skew larger, typically from 8mm to 18mm, ranging from the size of petit pois to a large grape. All are ideally shaped for a stunning statement ring or a bold, modern necklace or earrings. Tahitian black pearls actually encompas a whole palette of colors, including dark green and peacock - a tone that is an enigmatic iridescent blend of blues and greens. While the subtle hues of each example may vary, the black pearl’s effect is unfailingly dramatic. Keshi Pearls: Keshi pearls are a shape rather than a type of pearl as is commonly believed. Keshi means "poppy seed" in Japanese and these pearls are often also referred to as "poppy seed pearls." They are formed when the oyster rejects and spits out the implanted nucleus before the culturing process is complete, or the implanted mantle tissue fractures and forms separate pearl sacs without nuclei. These pearl sacs eventually produce pearls without a nucleus. Keshi pearls can form in either saltwater or freshwater mollusks. They are generally small in size and because there was no nucleus to guide the ultimate shaping of the pearl, their shapes vary broadly. Keshi pearls come in a wide variety of colours and tend to have high lustre and even orient. This is due to their solid-nacre composition - the implanted nucleus of the pearl has been expelled by the mollusk resulting in 100% nacre. This gives it an especially lustrous and shimmering surface quality. Most keshi pearls, in fact, have a greater lustre than even the best-quality cultured pearls. The fact that keshi pearls are solid nacre does not, however, give them the classification of natural pearls. This is because keshi are a bi-product of the culturing process, not a natural occurrence. Since the shapes have a wonderful variety and their all-nacre composition often gives them great luster and orient, keshi pearls have become much appreciated by jewellery designers and customers. Keshi pearls, especially South Sea keshi, were once quite the bargain yet beautiful and unique pieces. Today South Sea keshi pearls are much rarer. This is because South Sea pearl farmers are now x-raying oysters to determine whether or not the nucleus has been expelled. When a nucleus-free oyster is found they are re-nucleated before a keshi has time to form. This practice has made South Sea keshi pearls much harder to find than was once the case. Freshwater pearls: These are usually cultured in freshwater lakes and ponds. China and the US are the leading sources. Chinese Freshwater pearls have changed from tiny irregular pearls two decades ago to a huge variety today, from golden baroque pearls with fine luster to large spherical white “Edison” pearls. 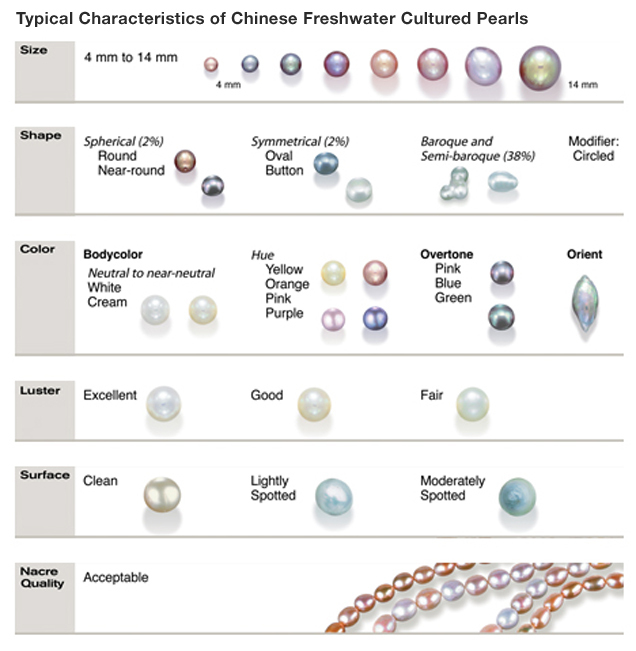 There are in fact so many different size, shapes and colors that makes the Chinese freshwater pearls so versatile and a good substitute for Akoya Pearls and South Sea pearls.